A study published recently in the AACR’s journal Cancer Immunology Research describes an important update to the CAR T-cell technology, in which researchers have devised a mechanism to turn the CAR T cells “on” or “off” using a remote-control switch in an effort to tackle the toxic side effects of this promising form of immunotherapy. The switch is the antibiotic doxycycline. As described previously on this blog, CAR T-cell therapy is a type of investigational immunotherapy that is based on a technology called adoptive T-cell transfer. It involves removing T cells from a cancer patient’s body, then modifying them so that when reintroduced into the patient’s body, the “equipped” T cells can multiply, recognize the patient’s cancer cells, and attack them. CD19CAR T-cell therapy is a type of CAR T-cell therapy that targets the protein CD19 present in B cells. CTL019, a form of CD19CAR T-cell therapy, received a breakthrough therapy designation from the FDA in July 2014 to help expedite the development of this therapy for patients with relapsed/refractory acute lymphoblastic leukemia. This investigational therapy has resulted in exceptional treatment outcomes in some pediatric patients with leukemia, the most common type of childhood cancer. The CD19CAR T-cell therapy currently being tested in clinical trials to treat B-cell cancers are always switched on and not selective, meaning, they cannot distinguish cancerous B cells that have high levels of CD19 from normal B cells that have physiological (lower) levels of the same protein. Depleting B cells can be tolerated by adults undergoing this treatment who have non-CD19-expressing immune cells with established immunologic memory, but that is not the case with children. Depleting B cells in children, therefore, can result in increased risk of infection and other complications. So, researchers have been experimenting on ways to tinker with CAR T cells to make them more specific and safe. One approach is to be able to turn the CAR T cells on or off using a remote-control switch, as demonstrated by the authors of this study. Why remote-control CAR T cells? “When considering CAR T-cell therapy, one of the major concerns is the ‘on-target, off-tumor’ effects. 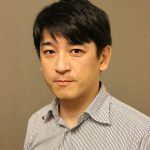 To reduce the toxicity, it is desirable to make the T cells switchable,” says study author Seitaro Terakura, MD, PhD, research associate in the Department of Hematology and Oncology at Nagoya University Graduate School of Medicine in Japan, who co-developed a “Tet-on inducible system” that can control CD19CAR expression during therapy. “Before the emergence of switchable CAR, suicide-gene system was the mainstay of controlling gene-modified T cells,” Terakura explains. Suicide-gene system is a technology in which the CAR T cells are designed to self-destruct when an appropriate agent is administered to the patient. “However, we don’t want to kill the gene-modified T cells because preparation of gene-modified T cells is always very expensive,” he adds. Further, eliminating the modified T cells altogether may also result in disease progression. “Instead, we wanted to keep those modified CAR T cells alive and controllable by administering a drug,” Terakura explains. The Tet-on system is an inducible gene expression system in which the antibiotic doxycycline (which belongs to the tetracycline class of antibiotics, hence the name Tet), when administered, binds to the transcription start-site of the gene to make the protein of the gene of interest. In this particular study, the researchers engineered a reverse Tet transactivator (rtTA), which comprises a doxycycline-binding Tet-repressor mutant protein and a C-terminal activator domain from the herpes simplex virus VP16 protein. In the presence of doxycycline, the rtTA induces the expression of CD19CAR gene, enabling the CAR T cells to go after the cancer cells. Importantly, this inducible system is “on” only in the presence of doxycycline. When the administration of doxycycline is stopped, the CD19CAR T cells are no longer functional. “Using the Tet-on system, it is possible to maintain the gene-modified T cells without killing them. We have not proved this in humans yet, but it is a potential advantage over suicide-gene technology,” Terakura says. 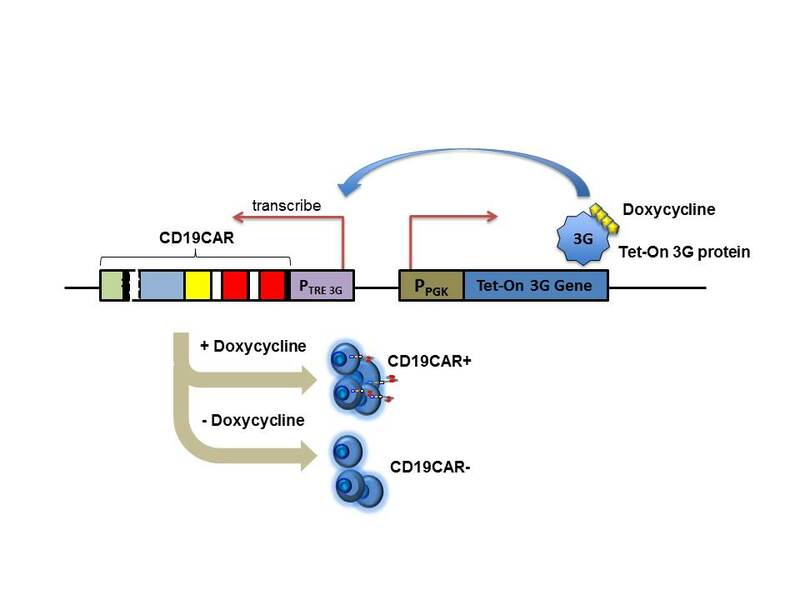 Schematic representation of the switching “on” and “off” of Tet-CD19CAR expression by doxycycline administration and discontinuation. Image courtesy of Seitaro Terakura, MD, PhD. The investigators performed a series of functional assays to prove that the CD19CAR T cells that were designed to respond to doxycycline, the Dox(+)-Tet-CD19CAR T cells, effectively killed a variety of CD19-positive target cells and secreted cytokines that are needed for effective tumor cell-killing. When tested in animals bearing human blood cancer cells, the Dox(+)-Tet-CD19CAR T cells showed significant antitumor activity. CD19CAR T cells that were designed to not respond to doxycycline, the Dox(-)-Tet-CD19-CAR T cells, did not have any of these antitumor effects. 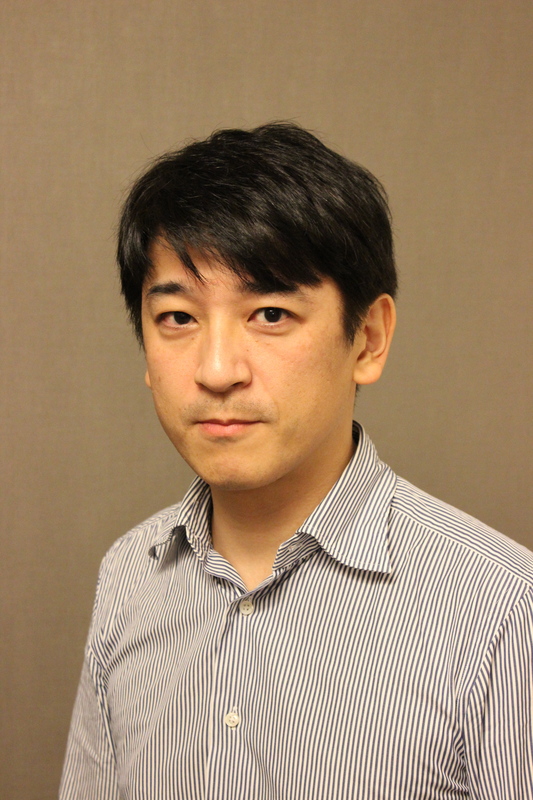 “I was a bit surprised when I saw a pretty good segregation between Dox(+) CD19CAR T and Dox(-) CD19CAR T effects in vivo,” Terakura says. “With some improvements over our current version, we could possibly control CAR function in a switchable manner that could be used in clinics in the near future,” he adds. Carl H. June, MD, who pioneered CTL019, wrote a commentary on this paper, titled “Remote Controlled CARs: Towards a Safer Therapy for Leukemia.” In his commentary, June, who is the director of the Translational Research Program and the Richard W. Vague Professor in Immunotherapy at the Abramson Family Cancer Research Institute at the University of Pennsylvania Perelman School of Medicine, says that the use of engineered T cells that target CD19 to treat B-cell acute lymphoblastic leukemia in clinical trials “has shown the greatest promise in the field to date.” Recent updates to this technology from biotechnology and pharmaceutical companies indicate progress and promise, he notes. The “switchable” CARs technology that Terakura and colleagues have described “may present a solution to the complications other researchers have encountered with constitutive CARs,” June writes. However, an important issue with such technologies has been the amount of baseline activity or “leakiness” while in the “off” state, he adds. Another issue that June points out is that the Tet-on inducible system is made of prokaryotic and viral components, which could potentially be immunogenic and may make the patients’ systems reject these modified CARs. “Indeed, it is likely that the principles of synthetic biology combined with cellular engineering will permit the design of an array of CAR T cells that fulfill the various activity states of Boolean logic gated circuits, such as AND, OR, and NOT gates that are switchable. These next-generation designs should enable increasing precision and potency of CARs that will be controllable by the medical team,” June concludes. More on these topics soon! Many more exciting immunotherapy advances are being presented at the Second International Cancer Immunotherapy Conference, co-hosted by the Cancer Research Institute (CRI), the Association for Cancer Immunotherapy (CIMT), the European Academy of Tumor Immunology (EATI), and the American Association for Cancer Research (AACR) in New York, Sept. 25–28. Stay tuned!